CipherShed is a lightweight piece of software designed to help you create encrypted containers where you can safely store sensitive data, such as financial documents, for instance. CipherShed is an open source encryption tool that helps you keep your data secure and private. It creates an password protected file that can be mounted as a virtual hard disk. You can copy any number of file and folders to this disk. The file can only be mounted using its password. 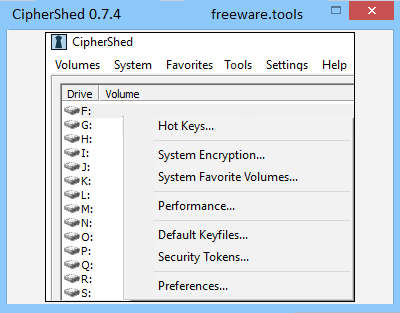 CipherShed can also be used to encrypt an entire disk volume or drive. In other words, you can keep the data that you store on your computer encrypted and hence, safe from getting in the wrong hands. First off, you should know that the installation kit provides you with the option to install the application as standalone or portable. Regardless of the method you choose, the setup is uneventful and does not entail further configuration. Even though it is not exactly a looker, the interface is clean, airy, intuitive and is unlikely to give you any challenges. While a large percentage of the UI displays the encryption containers, you can find the options and features in the menus located in the upper section. At the same time, you can access options, such as restore volume header, backup volume header, change volume password or set header key derivation, for instance from the Volume Tools. Creating a new volume where you can safely store your data is a fast and forthright process. Then again, if you never used this type of applications before, then do not hesitate to check out the manual, as it presents a detailed guide on this topic. The program allows you to choose between various options when creating a new volume, including, but not limited to implementing hidden volumes, hash and encryption algorithms or the format, just to name a few. A further noteworthy function is that you can create a hidden operating system that cannot be accessed or even proven that it exists in case of emergency. Creating a hidden operating system can be obtained in the same manner as the one enlisted above. In the eventuality that you are looking for a solution to keep your data secure so that your data cannot be accessed no matter what, then perhaps CipherShed can come in handy.